BROWARD COUNTY, FL – From April through May 2016, residents in participating Broward Water Partnership communities are eligible to participate in the Neighborhood Water Challenge. There are two categories to compete in: Water Conservation and Outreach and Education. In the Water Conservation category, neighborhood teams of 2 – 5 can get together to conserve water. The second category, Outreach and Education challenges contestants to develop and implement an outreach program to help their neighbors understand that conservation and reuse are more than saving water, they are about using all of our water resources wisely. Each first place winner will receive $1000 cash. Second place winners will receive a water-conserving irrigation system. The contest is sponsored by Broward Water Partnership, WateReuse Florida and Water-Optimizer. Contestants must register by March 15, 2016. Program details are available at ConservationPays.com. In the Water Conservation competition, neighbors will work together to save water over a two-month period. Water savings will be determined by comparing 2015 water bills with 2016 water bills. An average savings for each team will be calculated. The team that saves the most wins. Each (family) participant in the winning team will receive $1000 cash. Each neighbor on the second place team will receive a Water-Optimizer irrigation system. Teams aren’t necessary for the Outreach and Education Competition. A single resident or family can sign up to create an outreach and education plan to help their neighbors understand that conservation and reuse are more than saving water-they are about valuing and using all of our water resources (the right water for the right purpose) and the various ways we can do that including stormwater and recycled water. 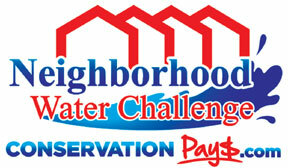 Contestants can register for the Neighborhood Water Challenge online at ConservationPays.com or download and mail or email the form. Broward Water Partnership is a collaboration of Broward County and 18 utilities and local governments. In addition to the Neighborhood Water Challenge, some members of the Partnership offer high efficiency toilet rebates and other conservation devices like aerators and low-flow shower-heads. In the past four years, Broward residents, nonprofits and businesses have saved nearly 800 million gallons of water through the ConservationPays program from Broward Water Partnership. For more information visit ConservationPays.com. Broward County’s Environmental Planning and Community Resilience Division protects, restores and enhances the quality, abundance and diversity of the County’s natural resources through coordinated management efforts in five areas: water resource policy and planning, urban and natural lands management, beach and marine resources, energy and sustainability, and environmental monitoring.